Though Toronto Gold is one of the newer places in Toronto to sell your gold and silver, our sister stores in Vancouver have been all over the news. (We hope to start making news as well, soon.) See below for some clips on the Vancouver Gold stores. Who can resist the pitch: cash for gold? In fact, so many people are rifling through their old jewelery looking for gold that the only thing that has climbed quicker than the price of bullion in recent months has been the number of people willing to take it off your hands. And with gold expected to renew its long-term climb toward $2,000 an ounce — up from $252 in mid 1999 — you can expect more hucksters to appear on your television with the same “bring me your gold” pitch. Last year in Massachusetts when the Attorney General’s Office took the same piece of gold jewelery to a number of store-front buyers they were offered a wide range of prices. And in the same year the New Jersey Office of Weights and Measures issued more than 1,600 summons against the owners of gold- and jewelery-buying businesses, alleging they used inaccurate scales to fleece consumers. In Canada, police have yet to launch a full-scale investigation into gold scams. But Pollock says it’s no better here. His firm has done its own informal survey, sending out a piece of jewelery and repeatedly getting lowballed on its value. Another popular rip-off is to advertise that you’ll give people 100 per cent of the value of their gold. In other words if gold was trading at $1,400 an ounce, you would get the full price. But Pollock says the 100-per-cent promise — usually offered only through the mail — is often just a come-on. 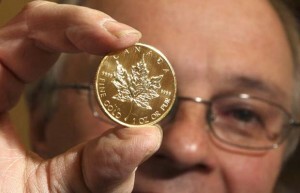 The seller will get a cheque for 50 per cent of the gold’s value, but is never made aware of its true worth. There are other problems with the mail, says Pollock, noting in one case in Canada about 60 people were told their gold had gone missing in the mail. And of course, the firm closed up shop. Pollock also says Canadians should be wary of gold parties. People are invited to bring their gold to these gatherings where they are wined and dined while their gold is weighed. But the people putting on the party often don’t have the tools (or the motivation) to accurately assess the value of the gold in the first place, and those attending usually get about 50 per cent of the real value. The same applies to the hustler who blows into town for the weekend, sets up in a hotel room and invites the locals to sell their gold. Like a scene out of a classic Western he usually pays between 30 and 50 per cent and leaves with a tidy profit, while the locals are left wondering if they got their money’s worth. Pollock has also discovered that where you live will dictate how much you’ll get for your gold. If you shop around in Vancouver and Toronto you can get 70 to 80 per cent of the gold’s value but in Ottawa you’ll be lucky to get 60 per cent. He blames the difference on competition and the prevalence of scams like gold parties. It’s easy to con someone, says Pollock because selling gold jewelery is also more complicated than just dropping a bracelet on the weigh scale and getting paid out at the current price for gold. There are actually four levels of purity in gold used in jewellery: 10, 14, 18, and 24 karats. And 24K is thought to be the purest form of gold, so the pieces composed of this purity should earn you the most cash. 1. Don’t let the dealer dictate the current prices for gold, silver, platinum, and palladium. Make sure you know before entering the store. “At least know the price per gram that you expect to get,” says Pollock. 4. Cut out the middleman. The guys on TV urging you to bring your gold down to the store for cash are middlemen. They in turn have to have a refiner melt down the gold. But you can also take your gold to a refiner, and get considerably more for it in the process. But Pollock says going directly to a refiner only makes sense if you have a lot of gold. If you’re talking about a bracelet or two, talk to a local buyer. 5. Head for the exits if the buyer starts talking about refining costs, commissions or fees of any type. Pollock says you always want to deal with someone who has the equipment to give you an honest appraisal and you should leave with 70 to 80 per cent of the price of the gold you are selling. on Tuesday. It closed at over $1,000 an ounce as ongoing concerns about the global financial picture have played a big role in its rise. The question now is how high will it go? LONDON – The price of gold, a safe-haven investment in times of economic uncertainty, struck an all-time high above 1,269 dollars an ounce on Tuesday. Gold hit 1,269.45 dollars on the London Bullion Market at 1410 GMT, beating the previous record of 1,265.30 dollars an ounce struck on June 21. “Renewed sovereign debt concerns” have driven up gold, said Robin Bhar, senior metals analyst at Credit Agricole bank. Fears of a resurgent eurozone debt crisis are likely to stunt European economic growth prospects this year, the EU warned on Monday. Gold, whose two main drivers are jewellery and investment buyers, is also regarded as a good store of value in times of high inflation. Amid rising bullion prices, the International Monetary Fund last week said it was selling gold worth around 403 million dollars to Bangladesh. The Washington-based institution has been selling gold as it seeks to bolster its finances amid the global economic crisis. IMF members agreed in 2008 that the fund could sell an eighth of its gold assets in order to diversify its financial model. The fund is one of the world’s largest holders of the precious metal.